100% Nitrile Rubber is the key! Contains 10% recycled material too, not to mention 100% customer satisfaction Guaranty!These made in the USA or America Kitchen mats and or Restaurant mats, are truely the best. Used in Food Trucks too, and really all and any food service industry situations. Great for Commercial and Industrial situations too. 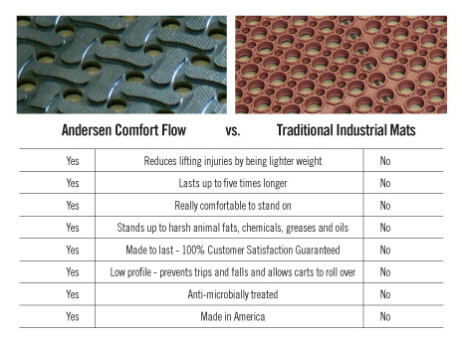 Comfort Flow mats are thinner, light weight, yet tough and strong when it comes to chemicals, animal fats, greases, oils and other damaging liquids. Thinner means less of a trip and fall hazard as well as easier carry and wheel traffic. The comfort and safe traction comes from the softer comfortable 100% Nitrile Rubber, better grip and traction. Help keep things cleaner and healthier because the Comfort Flow mats are treated with an anti microbial germ killing additive. Compare to other kitchen and restaurant mats and matting as well as other industrial, commercial, food truck, and or food service industry mats and matting – see chart above, and try one out for yourself! o AATCC Test Method 134-1991 Electrostatic Propensity of Carpets. Maximum Voltage Negative 0.3 KV.